With a growing number of investors from all skill levels migrating the to the Forex markets, there is more of an opportunity than ever before. Much like any trading strategy, there are some worthwhile recommendations to keep in mind as well as some pitfalls to avoid. Let us look at both sides of this spectrum in greater detail. 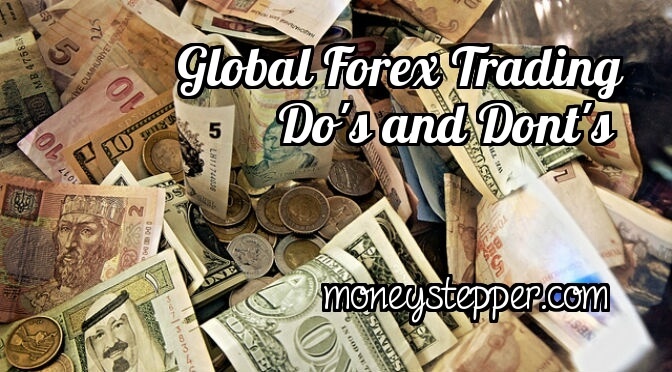 Many are tempted by the Forex market due to its sheer size and liquidity. Short-term profits are very real possibilities and there is no doubt that sizeable fortunes are made every day. However, this also translates to a significant amount of risk. Many would-be Forex “cowboys” have had their funds wiped within only a few trades when their greed overtook their sense of rationality. Never place more funds into any one position than are able to be lost. It is critical to recognise that even the most experienced Forex and CFD traders will find themselves in unfavourable scenarios from time to time. Another issue which should be addressed here revolves around the principle of diversification. Should only a single currency pair or contract for difference be chosen, the chances are much hire that such trades will suffer from volatility. It is always prudent to spread one’s funds around into multiple sectors. Without such stability, the trader will be subject to the whims of the open market. The success or failure of any trader is always associated with the electronic platform that is used. Lesser-quality trading systems or slow portals simply will not do. As trades need to be carried out nearly instantaneously, any system must be highly intuitive and easy to interpret. Tools such as automatic stop losses and chart interpretation also come in quite handy; particularly when multiple trades are being executed simultaneously. Objective reviews and popularity will speak volumes about any such system. Firms such as CMC Markets are highly reputable and offer only the most advanced software. Without these aids, enacting a winning trade is nearly impossible. Some novices are quite confused in regards to the number of different trading strategies which are available. As a result, they fail to adopt one method over another; always remaining “on the fence” in terms of a trade. This can also be very detrimental to profits. Uncertainty will inevitably lead to hesitance. A hesitant trader is one who fails to take advantage of the relevant market movements at the most appropriate times. This can result in frustration and basing decisions off of emotion as opposed to logic and strategy. In simpler terms, any new investor should experiment with multiple methods (such as through a demo account) until he or she encounters the best strategy that suits his or her purposes. Although becoming a successful Forex trader will certainly not happen overnight, the potential for growth and financial independence can be very real. Understanding these recommendations and appreciating a few pitfalls is the formula for success in such a liquid marketplace.